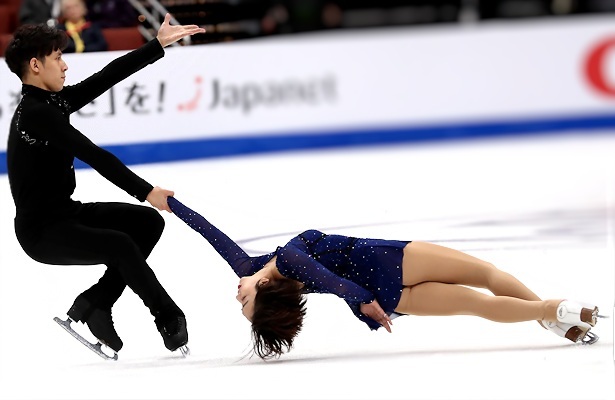 China’s Wenjing Sui and Cong Han won their fifth Four Continents title in Anaheim, Calif.
After reclaiming their title at the 2019 Four Continents Figure Skating Championships, China’s Wenjing Sui and Cong Han are now gearing up for the 2019 World Figure Skating Championships in Saitama, Japan. The road back as not been an easy one for the duo who made their first international appearance this season in Anaheim, Calif.
Sui has been plagued with various foot injuries off and since the 2012-13 season. This season, the 2018 Olympic silver medalists withdrew from both of their assigned Grand Prix events as she continued to recover. They competed their short program at the 2019 Chinese Champions, but withdrew before the free skate. The skaters, who partnered up in 2007 and are coached by Hongbo Zhao, Bing Han, Jinlin Guan in Beijing, China, were thankful for the help and support they received from the Chinese Skating Association after the Olympics. Sui had actually forgotten about the first time they missed the Grand Pix and came to the Four Continents during the 2015-16 season. In Anaheim, the team placed second in their short program. The only glitch was when Sui fell on the side-by-side triple toes. Han said they went through a lot of “bittersweet moments” during the short program and in the end, felt they only did eighty percent of what they were capable of. In the free skate, Sui fell again on the side-by-side triple Salchows. Still, their routine was mesmerizing, and they were solid throughout the rest of the performance. They scored 136.92 for first in the free skate and edged out Canadian champions Kirsten Moore-Towers and Michae by .06 points from the top spot with a total score of 211.11. Despite the win, the pair was not entirely satisfied. Han said the free skate was actually the worst compared to their practice run-throughs. Nevertheless, they felt the competition was a good motivator for them and enables them to reflect and improve before the World Championships. Sui and Han are using “Rain, In Your Black Eyes,” beautifully choreographed by Lori Nichol, for their free skate. Nichol has a very large and ever expanding playlist of possible pieces for Sui and Han. Due to unforeseen circumstances, however, they had very little time to share ideas and concepts and create programs for the Olympics. The skaters had more time this go around to delve into the ideas with the new programs. However, they had to be very careful and grow gradually due to Sui’s injury and recovery. The renowned choreographer records just about everything during sessions and never gives up hope. After pocketing their fifth Four Continents title, the team is now preparing for the 2019 World Figure Skating Championships which will be held in Saitama, Japan, from 18 to 24 March 2019. At the 2002 Cup of Russia, Evgeni Plushenko (RUS) became the first skater to perform a quadruple toe-triple toe-triple loop combination in competition. More on Evgeni Plushenko from Golden Skate.